For many of our students, getting into a good college is a top priority. They work like crazy to get perfect grades, spend years enrolled in test-prep courses, and sign up for every extracurricular activity available. After all, this is what they have been advised to do. 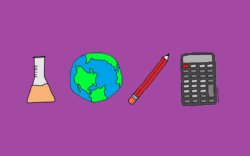 It turns out that this widely prescribed triad of perfect grades, perfect test scores, and a laundry list of extracurriculars may be a bit…imprecise. In other words, a lot of what we think will get students into highly selective colleges might actually have the opposite effect. What’s worse, a lot of those activities can be incredibly time consuming, energy draining, and expensive. Shirag Shemmassian has had plenty of experience with college applications. He attended Cornell University and UCLA himself, spent several years as an admissions interviewer at Cornell, and now, through Shemmassian Academic Consulting, he teaches students and their families how to achieve college admissions success. Over the years, Shemmassian has learned what factors really make colleges take notice, and what he has to share might surprise you. 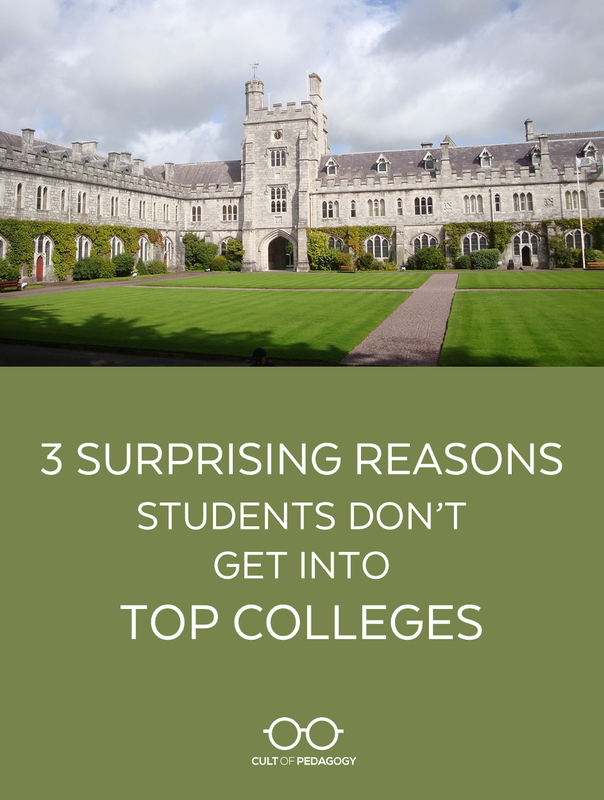 Here we’ll take a look at three mistakes students make in the name of getting accepted into their top college choices. Shemmassian explains why these choices are counterproductive, and what students should be doing instead. But every one of those classes requires a great deal of study time outside of class. If course loads completely max out all of students’ available free time, it limits their ability to pursue other things. And those “other things” are ultimately what will make a student stand out to colleges. 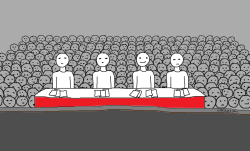 Students are all hearing the same advice, so they, of course, end up looking like every other applicant. So what should students do instead? When students spend years enrolled in test-prep courses and devote hours studying for, taking, and retaking these tests for the sake of a few more points, they are using up time that would be better spent deepening their experiences within some area of interest. And even if a student does attain those perfect scores, without anything else to differentiate him, he simply won’t stand out. It’s important to remember that it’s not all 1600 scores who are going to Ivy League schools. Instead, students should take a more reasonable approach that values a good test score, but not at the expense of other activities: Pick a period of time to really focus on test prep—Shemmassian recommends about a semester—during which time a student should study intensely, take the ACT or SAT a few times and shoot for a score between the 25th and 75th percentiles of admitted applicants at their schools of choice. Once these first two mistakes are out of the way—once a student is no longer spending every hour of their free time studying for tests or maximizing their course load—how that student spends the remaining time is what will make the biggest difference to college admissions officers. “People think that colleges want to admit ‘well-rounded students,’” Shemmassian says. So students join as many clubs and teams as possible and try to pursue leadership positions in each one. Instead of being Jacks of all trades, students should figure out what they’re really passionate about, then become a specialist—what Shemmassian calls a “Michael Jordan”—in that area. But what if a student doesn’t know what to specialize in? What if she doesn’t feel she has natural talent in any one area? If there is one theme that unites all three of these, it’s that students who want to get into top colleges need to be doing less of the stuff that doesn’t make a big impact so they can do more of what does. For students whose schedules are packed with an insane number of classes and activities, this advice should come as a relief, giving them permission to figure out what really matters to them, what they were put on this earth to do, then devoting plenty of time to pursuing that. You can learn more about how Shirag Shemmassian helps families succeed with college admissions at Shemmassian Academic Consulting. Great post…wish we’d seen this years ago! My daughter is a senior and the last 4 years have been all about the college app! Fortunately, she did get into her “reach” school and we’re so excited. One thing does occur to me though about specializing in one thing. Teens are still so young. They are figuring out who they are and what they like and are good at. On the one hand, I would think that trying out lots of different activities is exactly what most of them should be doing as they explore the world around them and try to find their place. No one needs to be an expert at 17. 1) Grade in school: We like to think of the exploration process as a funnel. At the start of high school, students may not know exactly which field(s) they want to get deeper into. For example, a 9th grader may be interested in tennis, computer coding, and fashion. After exploring opportunities in all three, they may realize they prefer computer coding and fashion the most. In 10th grade, we’d encourage them to take “the next step” and go deeper in their chosen areas. In 11th grade and beyond, we’re in the refinement and growth stages, where we encourage students to get very focused on one or two areas and really think about making the biggest community impact as possible. Of course, the sooner a student begins this process, the deeper they can go down the funnel and the greater the specialty they can develop (i.e., the narrow part of the funnel). 2) Number of areas: While exploration is a good thing, there needs to be some focus. What colleges don’t like to see is students doing a little bit of a lot of things. The better approach, regardless of their chosen field(s), is to figure out what exactly about that activity they like. For example, if a student loves volleyball, I would ask them, “What aspects of volleyball do you like?” Whereas one student may say they enjoy the competition, another may say that they enjoy the exercise and nutrition associated with it, and yet another may say they most enjoy the teamwork. Then, we brainstorm with the student how they can make a big impact through volleyball in the ways they would like. Within that even, we encourage students to explore. Do you like the exercise and nutrition aspects of volleyball? If so, let’s consider setting up a small program for community kids to teach them about exercise and nutrition. Didn’t enjoy that? How about raising money through volleyball and donating it to a health care foundation. Enjoyed that? Let’s discuss ways to partner with larger organizations to increase your impact. And so on. Again, congrats to your family and thanks for your thoughts! Hi! As a freshman in high school, I have no idea how to start preparing for college but I’m determined to get into my reach school! Every source I’ve ever pursued says freshman year is far too young to start. Can you take me through how your daughter started and began her college application journey throughout grades 9, 10, 11 and 12? Or if I could speak to her myself? Thank you so much! My school has no college counsellor and I am desperate. I am an avid reader here, I have learned a lot and implemented all kinds of things you’ve suggested, and shared them with others. Usually I love what you write. Not today! Some background: I teach 8th-grade science in a relatively well-resourced suburban district. It’s more diverse than people realize, but still pretty homogeneous. I live in an urban district with what may be one of the most truly diverse high schools in the country. My family is multiracial and bilingual, with one child a freshman in college now and one who graduated two years ago. So I am writing both as a teacher with students who are going to high school and thinking about their path there, and as a parent who has been through the college process twice. My main problem with your post is that the key issue facing 90% or more of students in college selection is absolutely NOT how to “Get Into Top Colleges.” This applies across a huge range of districts, mostly regardless of demographics except in very extreme cases. There is tons of college advice out there and a wildly disproportionate amount of it is on this topic. I’m sorry to see you contributing to this trend because I think it’s a bad one. The advice is often pretty good, it’s the preponderance of it that’s the issue. I think the constant drumbeat about “top colleges” encourages most students to think that they should be trying to go there. Students end up feeling they need to focus on “how to be (or at least look) academically amazing” — and then feel badly about not living up that standard — when they should be focused on “how to be (and present) *you*.” There were inklings of the latter in your interviewee’s comments, but mostly his advice is still about how to be amazing, in a very particular and elite academic way. One example: His idea of an SAT score one might be dealing with was 1480 – 1540. My daughter goes to an excellent and very well-respected public university where the 25th – 75th percentile SAT scores are 950 – 1160. If you are that student with an SAT score of 1000 and the advice you read is constantly talking about a range like 1480 – 1540 as if that were the norm, what will you think? He also says students should be the “Michael Jordan” in the extracurricular are they choose to focus on. Really? So if you are not Michael Jordan — and most of us aren’t — where does that leave you? (I also agree with the other poster that students should be able to explore different areas in high school, not have to be come experts to impress colleges.) Some students will find one or two extracurricular things to focus on in high school, others need to explore. Pretty much no one needs to try to be Michael Jordan. In fact most students do not go to top colleges, should not be trying to do so, won’t do well there, and can’t afford them. If you want the stats, infoplease.com counts 2474 public or private 4-year colleges in the US. collegesimply.com ranks 291 of them as having acceptance rates under 50%, and only 37 as under 20%. The key issue for most students is not how to get in to a really selective school. It is “fit” — what’s the best place for that student? That’s very different, very important, and as it turns out there are a LOT of students out there who don’t find a good match. That is where our efforts and discussion need to go, both so students generally do well and for the sake of equity. For a fairly careful study which documents the high prevalence of both undermatching (choosing a school that’s not challenging enough) and overmatching (choosing one that’s too challenging), see the news article from Inside Higher Ed at http://tinyurl.com/ldjq448, or the full study at http://www.nber.org/papers/w19286.pdf. Undermatching is well-documented as particularly affecting college prospects for poor students and students of color, and something we have also seen clearly among some of our children’s friends. The study is very clear that the issue driving these trends is not admissions decisions but student choice. So bottom line, I’m not happy to see one more discussion about getting into “top colleges.” I don’t think it serves students well or promotes equity. However, I would love to see you do something about “fit” and the undermatching and overmatching, especially the former. I think they are bigger issues. I really appreciate you contributing to this discussion because you bring up several excellent points (e.g., focusing on “fit”, educational disparities). Moreover, you bring a unique perspective as an experienced parent and teacher, let alone being part of a diverse family and living in a diverse part of our country. Despite the centrality of “top colleges” in my conversation with Jenn, the same advice applies for schools in any tier. We could’ve used the title, “3 Surprising Ways to Maximize College Admissions Odds” and the guidance would’ve been the same. Suppose we divided colleges into (admissions) competitiveness tiers, such as “ultra competitive,” “highly competitive,” “moderately competitive,” “less competitive,” etc. A student with higher grades and test scores would be more likely to get into the “ultra competitive” and “highly competitive” schools than a student with lower grades and test scores. However, each student’s admissions odds will increase at schools within any tier if they develop a distinguishable specialty. In addition, I want to challenge the assumption that aiming for top colleges somehow puts you at greater risk for attending a poor “fit” school. Good fit and poor fit schools exist in any competitiveness tier. For example, if a very strong student wants to go to an Ivy League school, we would never tell them, “It doesn’t matter which one you go to, as long as you go to one of them.” Rather, I would ask them what they’re looking for in their dream college (academics, extracurriculars, programs, geography, etc.) and make specific recommendations based on that information. Similarly, if a student is aiming to attend a school in the “moderately competitive” category, we would take this individualized approach with them too. We take school selection very seriously because we want our students to not only get into great schools, but also thrive there. Nevertheless, following this advice will help students be more competitive for all schools, including the ones where they fit best. So why not increase the likelihood that they can actually get into those schools? We advise students across all backgrounds and ranges of admissions competitiveness and we’re glad to do it. I also want to challenge the assumption that “need[ing] to explore” and focusing on less activities is mutually exclusive. As I mentioned in my response to Vanessa above, I agree that every student ought to explore their interests before learning where they would like to devote more effort. The sooner and more deliberately this process is approached, however, the more focused–and less scattered–the student will typically be. The “Michael Jordan” effect happens naturally as a result of this process. I encourage you to read Cal Newport’s “How to Be a High School Superstar” for a lengthy discussion on this. Fortunately, students who follow the approach we discuss report having more free time and feeling less stressed than their peers, as well as having much clearer direction on which aspects of their academics and extracurriculars to prioritize. This is the type of fulfillment we hope that all students can enjoy. Can I just say Amen to what Tom wrote? I completely agree with what he said. I am a parent of two soon-to-be-applying-to-colleges teenagers, and I have been thinking good and hard about this. I went to a very “average” college myself, and enjoyed it. It was the right fit for me at the time. Even though the school was average, I have done well in my career. And I think about the people I work with – six figure salaries all (I’m the Controller so I know) – and know that they too went to “average” schools. As Tom points out, most people DO go to average schools. I agree with Tom that this obsession about getting our kids into the “best” possible schools is misplaced. The truth is that it is their aptitude for the career they choose, and their ambition that will guide their future success. Not where they went to school. Thanks for your comment, Nancy! It’s great to read how thoughtful you’ve been about your teenagers’ upcoming college admissions process. I agree with you that there’s nothing wrong with attending (as you put it) “average” colleges. There are intelligent and high-achieving students at highly selective and less selective colleges. Moreover, students can certainly enjoy their experience at less selective schools and pursue interesting and lucrative careers after graduation. Is it possible that individuals who do well career-wise would have done so regardless of whether they attended a highly selective or less selective school? Perhaps. Unfortunately, however, we would never be able to conduct a true experiment to answer this question definitively. However, the association between selective schools and income is intriguing. 2) The most selective schools tend to be the most generous. In other words, they cover a much larger percentage of students’ financial need than less selective schools. I actually graduated with my B.S. from Cornell and my Ph.D. from UCLA completely debt-free. I did this through a combination of generous financial aid and scholarships. However, I put in a lot of time when researching the schools I would apply to to make sure I could afford them if admitted. If students can attend a highly selective, good fit school at an affordable price, why not? At the end of the day, even if this podcast episode/article’s topic doesn’t resonate with you, I encourage you not to dismiss the strategies that can help your children maximize their admission odds. Regardless, I wish your children and your family the best of luck with their college admissions process–and beyond! Thanks for mentioning Lynn O’s resources. She is the best of the best. Of course, Susan! She’s developed so many fantastic resources for smart college planning. I SO agree with your comment. My son is currently at a “best fit” school. He loves it, he is challenged but not overwhelmed. My two very best friends coached their kids all through high school to get into “top” colleges. One hired a tutor everytime a grade dropped below an A. Do you know that BOTH these kids have dropped out of their top college? One had a nervous breakdown (well, more like serious anxiety). The other just wasn’t “happy”. Said he was burned out of studying………… Just sayin’ this obsession with college admissions has hit the breaking point. Tom, I understand your points and appreciate them, but I don’t think they are particularly relevant to this article. Nowhere was the claim made that getting into top colleges is “the key issue facing 90% or more of students in college selection.” This blog has a wide range of very specific topics, and the topic of this article IS, in fact, how to get into top colleges. So — the advice given was quite useful in that regard. Of course, the majority of students are not trying to get into top colleges, but for that minority who are, I think this article is great for them and their parents. Your analysis fails to take into account the specialty of the consulted expert. Your alternative topic, though, is important and one that should be expanded upon, but it is meant for a different reader. This article deserves a slot here as does one about your list of grievances. You lost me at 3, no 4 AP classes. That’s the problem. 3-4 AP is not appropriate for most students. Students are taking them, and getting stressed out because they, at 16-17, are not ready for college material. Or they take the “easy AP’s” which don’t mean much anyway. Also, it’s sort of nauseating the way it’s expected to have these resume building extracurriculars. Let them be kids! For 90 percent of them, it is not really about the activity as much as the resume. It’s ridiculous. There’s only one Michael Jordan, so that was a poor analogy. Thanks for sharing your thoughts on the interview, Momhere! I especially appreciate you pointing to specific guidance that you took issue with. I’ll address each one. 1) 3-4 AP classes not being appropriate for everyone: I agree, which is why I encourage students to take on the appropriate level of challenge for them. For some students, this will be 3-4 AP courses. For others, this number will be be 1, 2, or not at all. A student’s academic strengths, interests, and goals should be considered when making these decisions. During our conversation, Jenn and I discussed number of APs in the context of making sure to leave time to pursue extracurricular activities meaningfully, rather than join the high school rat race of signing up for everything. In my experience, students who take on too much, regardless of what is appropriate for them, do not leave enough time to explore and experiment. It’s precisely this exploration and experimentation that allows students to pursue fulfilling activities, which organically helps them develop “superstar” status on the college admissions front. 2) The expectation to have resume-building extracurriculars: Again, I agree with you that the activities students should pursue are the ones they actually enjoy. Not only does the typical approach to “resume building” leave students unfulfilled, it also leads to them blending in with most of the college applicant pool. 3) The Michael Jordan analogy: Your point about there being only one Michael Jordan is spot-on. Therefore, a student shouldn’t try to be Michael Jordan; they should work towards being the Michael Jordan of their preferred niche. To me, the most interesting–and relieving–part of this discussion is how any niche can be that particular student’s basketball court. It is harder to achieve this in some fields (e.g., becoming the best basketball player in the country, or even your state) than others (e.g., becoming the most noteworthy teen blogger on living with autism spectrum disorder). I’m sure many others share similar objections to my guidance, so I thank you for contributing to the conversation! This is an important conversation, which we also engage in with parents, students, counselors and consultants. Everyone is hungry for reliable information, and it looks like Shirag has provided a lot of good info here. For more, I invite you to visit our website (we only focus on application essays, but we know a lot about admissions in general) for solid, free resources. Mistake number 4: Thinking you need to get into a “Top College.” I am sorry but I have been in the business world for more than 35 years and before that I taught high school and never once was I ever asked what college I attended. Nor asked to provide transcripts. My deep belief is that unless you are trying to join a prestigious law, investment banking, research hospital, etc. no one is going to care where you went to school. A state school and Harvard mean the same thing in 80% of the jobs college graduates will get when they go out into the big world. Living in the Silicon Forest of Seattle I can also tell you that I know a number of people making incredible $$$ at software companies here in Redmond (guess which one) who have no college at all. Bill Gates never finished and he did pretty well. Between my wife and I we have three kids, all married. The ones without a college education (or just an AA) make substantially more than those with a college education. My daughter (an elementary school teacher) has her Masters and her brother makes more than her as a Costco manager with only an AA degree. I don’t believe it is right but I do know it to be true. Great schools are great for average students – not for high achieving schools. Gotcha. But in reality without the foundations of academia with pillars of standardized testing, there is no reason to put the roof of extracurricular on. Oh please. Grades and standardized test scores are what the colleges look at first. Does anyone really think a”well rounded” kid with a 1100 SAT would get into Yale? Even if he were lucky to get in with that score, he wouldn’t be able to handle the course materials and would be dropping out. Extra-curricular activities are great to pad the application and fulfill the college’s diversity agenda. 70-80% of the students don’t do much activities in college, especially if they majored in the hard science or engineering. High grades and internships are what needed to land a “dreamed” job for these scientists and engineers. I must disagree with your statement about the low SAT score not being able to handle the difficult work. Not everyone tests well, some don’t have families that can afford test prep or multiple SAT books. I scored under 1000 on the SAT and went to a CUNY school and did well. I then went to a very selective university for my second bachelor’s in a different area and had a 3.5 gpa. I contemplated a masters degree and scored a 98/97 percentile in the MAT (Miller’s Analogy Test) because it was more my kind of test. I’m in the third quarter of my sophomore year and I still have no idea what I’m interested in. I have looked around but nothing really clicks. Do you have any tips or advice? I’m kind of desperate, thanks!